This May, the studioINSITE family gave back to the Denver community by volunteering at the Denver Botanic Gardens Spring Plant Sale. Volunteers worked as Plant Valets, helping customers transport their purchased plants to their cars. We hope you're topping off the year with a constructive holiday, and look forward to building something special with you in 2018. Happy holidays to our friends and colleagues who are making wonderful things happen with us in communities where we live, work and play. At the Downtown Denver Partnership’s 10-year anniversary program this month on the Downtown Area Plan, several individuals and firms received awards for their leadership in implementing the goals of that plan. Dennis Rubba was recognized and awarded for “making the Downtown a more walkable city and enhancing the urban forest”. This includes his work leading the 14th Street Revitalization Initiative, from early idea and vision through design and construction; the AHEC Master Plan and Connect Downtown projects; California Street Improvements; 16th Street Mall Urban Design; and charter member of DDP Urban Exploration. In October, Jim Leggitt was an invited lecturer for a workshop and lecture at the University of NE Lincoln. He led an open lecture over the lunch hour to discuss 3-D and hand drawing techniques for the public realm and urban environments. He was also an invited lecturer for a landscape architecture studio workshop demonstrating and practicing a variety of methods of preparing drawing from site photos. Long before recent terrorist events in public spaces became a recurring event, landscape architects have been charged with designing protected public spaces. While U.S. Federal law mandates the protection and hardening of Federal Buildings, those protective requirements have not yet been extended to the public realm. Our challenge as landscape architecture professionals is to combine placemaking with public safety through the deployment of beautifully designed site elements. The landscape architecture profession should play a leadership role in the design of civic and public spaces that feel open, free, and community-oriented; not barricaded, dividing, or added as an after-thought. The public should be unaware of the protective aspects of the space, noticing rather a beautifully designed, inviting space. I was alarmed when reviewing a recent article on www.cleveland.com where Jersey barriers had been installed in Public Square after the city and homeland security raised concerns about potential attacks. This $50 million renovation of the square was completed in 2016, and yet in a space of this size and prominence, failed to integrate protective measures for the public as part of the original design. In my opinion, our profession should always consider public safety as part of the design process. 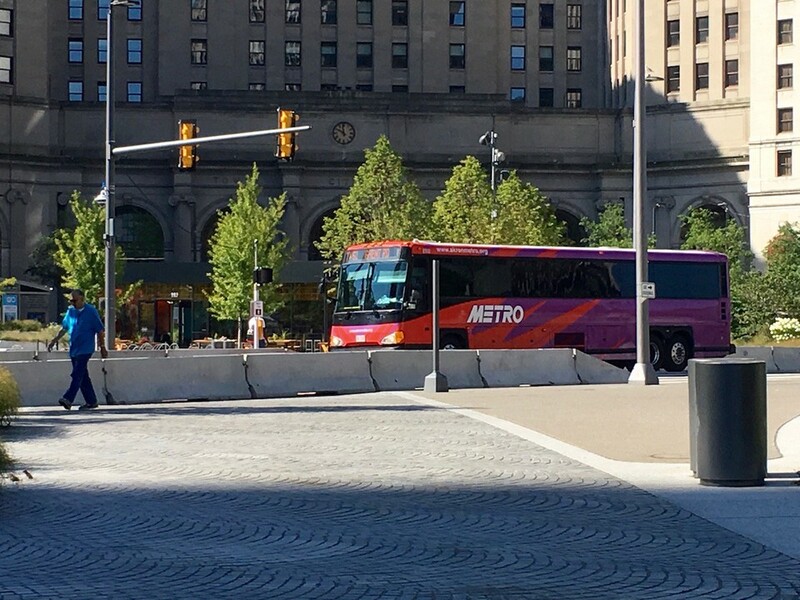 Photo of Public Square depict concrete Jersey barriers placed along Superior Avenue as a temporary solution to homeland security concerns about public safety. Steven Litt. The Plain Dealer. studioINSITE’s work on Denver Justice Center’s Dale Tooley Plaza is a good example of the application of 'protected placemaking'. The public realm surrounding the court and detention center buildings is a beautiful place, while at the same time serves as a very defensible space. Every site feature serves as a defensible measure - site plinth wall, steps, bollards, ram proof entry walls, art placement, curbs, site furnishings with ram resistant footings, etc. To the average person the plaza is a beautiful and welcoming gathering space, but to law enforcement is a successful example of hardening the facilities and protecting the public. Raised protected pedestrian spaces at the Detention Center. Ram and blast resistant site walls as part of the planting beds. Ram and blast resistant site walls. studioINSITE led a charrette with a development team to establish the appropriate residential mix for a lakeside development site on a former trailer park. Our team explored numerous high level site concepts to create a mixed use neighborhood oriented to lake views and open space amenities. A preferred alternative was derived from the best ideas from the various concepts. Our next steps will be to convert the preferred alternative into a 3D Sketchup model, prepare renderings and refine the final master plan. studioINSITE led a charrette with NE State Parks with the objective of creating a grand entrance for the park. The new entry would orient visitors to the park by providing historic, geologic and natural resource information. Our team developed concepts that would make these elements playful and artistic - a welcoming invitation to engage visitors. Additionally our team explored ideas to partner with the City of Ponca to create a series of wayfinding elements that would connect the park to the City. Following the charrette, a public open house was held to present the ideas generated and to gather feedback. This week studioINSITE held our seventh in a series of “Talking About Placemaking” (TAP) Programs where we explore tactical design strategies for embracing urban placemaking. The October TAP program focused on transit oriented development (TOD). Omaha still needs community education around using transit, taking alternative routes to downtown, and driving safely in more pedestrian/bicycle-friendly environments. This education is needed to provide the public opinion foundation to support success for BRT and TOD. We need to be specific when we discuss developing density along the BRT. There are certain station areas that are appropriate for 8- to 10-story buildings, like downtown and 84th Street. Along most of the corridor, 2- to 3- story buildings would be a significant increase in density and could be more acceptable to surrounding residential neighborhoods. The general opinion is that developers and designers would accept a TOD design overlay. Developers would be more confident in making a higher value investment and designers would have greater opportunity to enhance the pedestrian/transit experience. In addition to public opinion and regulatory support of TOD, there may need to be education for lenders and insurance providers to help make TOD projects economically feasible. studioINSITE was featured in the June 2017 issue of Landscape Architecture Magazine in an article discussing the recruiting practices of landscape architecture firms. One of the traditions studioINSITE employs in the recruit vetting process is the 'Gauntlet' - a collective meeting with the candidate by all staff members without firm Partners. 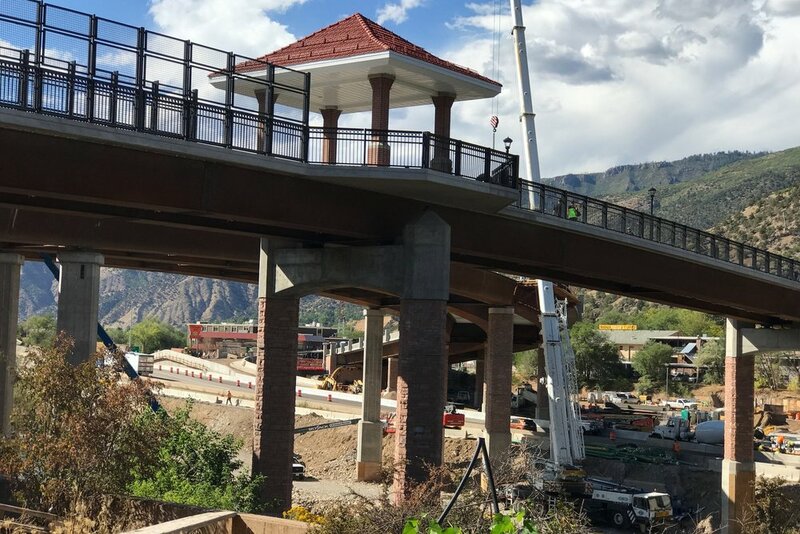 Glenwood Springs' Grand Avenue Bridge Comes to Life! 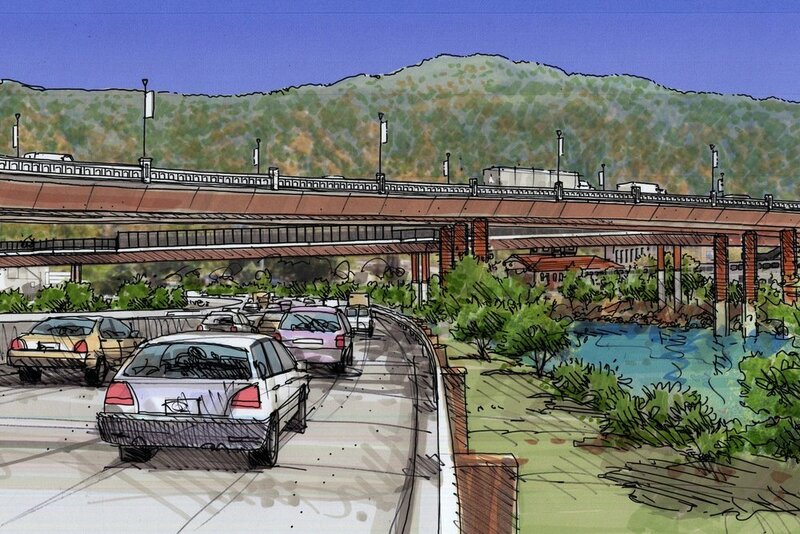 From vision to reality - how we work with engineers on envisioning engineering solutions to meet community aspirations. 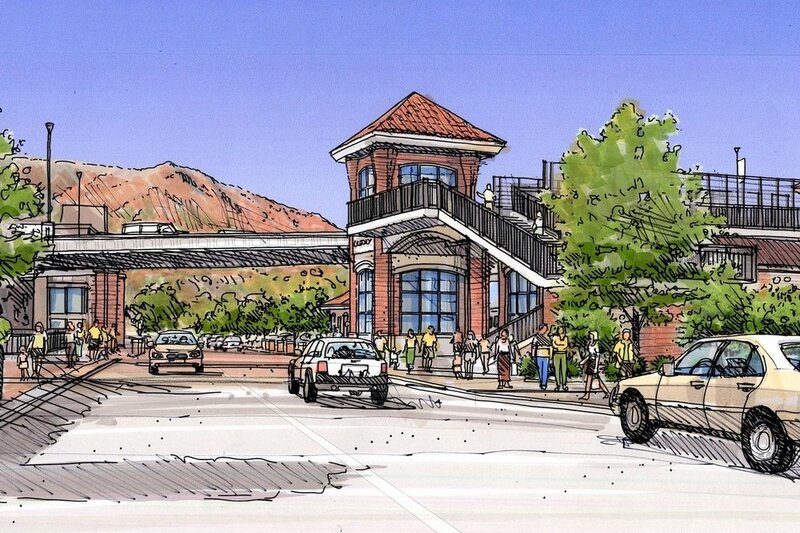 studioINSITE is pleased to have worked with Jacobs Engineering and Glenwood Springs Downtown Development Authority on the visioning and community outreach for the the Grand Avenue Bridge vehicular and pedestrian bridge projects. Vehicular bridge as it comes into downtown, with the elevator tower to the new pedestrian bridge to the right. View down 7th Street looking west, with the pedestrian bridge stairway in the foreground and the new vehicular bridge entering downtown in the distance. 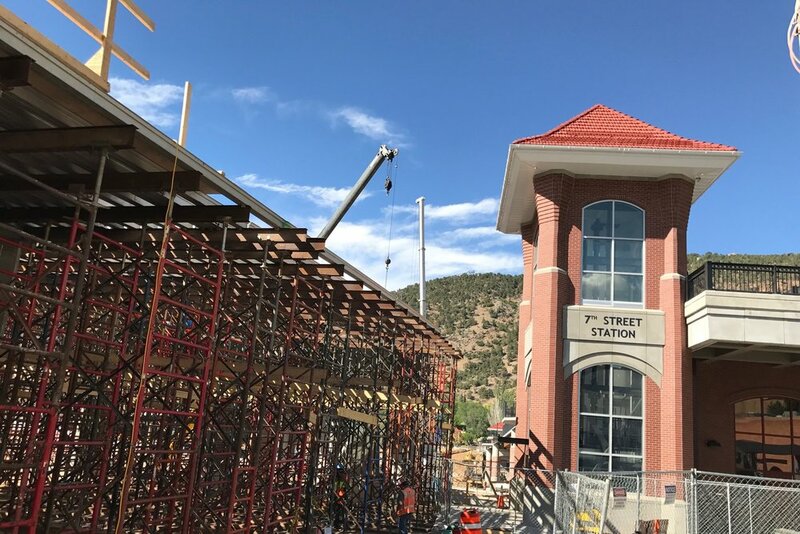 The bridge supports of both the vehicular and pedestrian bridges are designed with architectural sandstone veneer to match the historic character of the community. Stone finished planters and sign monuments line the bridge as it touches down in downtown at 8th Street. studioINSITE Kicks off National Western Center Campus Placemaking Study with MIG, Inc.
National Western Center Campus Placemaking Study with MIG, Inc.
As part of a team led by MIG, Inc., studioINSITE was selected by the Mayor’s Office of the National Western Center for a 3-year Campus Placemaking Study focused on placemaking for pedestrian scale activation. Working with the city and a range of stakeholders, we will explore concepts that include a mixture of types of public spaces for a wide range of uses, and strategies to preserve history and culture while re-envisioning the campus as a year-round entertainment, education and events venue. Building upon the original master plan completed by Parsons Brinkerhoff, our team will be responsible for refining the framework for all future campus developments, and creating links between areas of focused interest, resulting in a cultural plan, campus and building design standards and guidelines, and 30% site infrastructure, with extensive public engagement throughout the project. After sharing offices for the past three years, we're ecstatic to announce LandWorks Design has officially joined studioINSITE. This was an easy decision for us - we share the same business philosophies and strong dedication to our clients and built environments. The addition of the LandWorks Design team expands our idea-driven placemaking solutions to mountain, resort and recreational environments. We're working at places you may be familiar with - Staunton State Park, Snowmass Village, and Limelight Hotel in Ketchum, ID. These projects reflect our commitment to placemaking and pedestrian scale environments, while sensitively designing within the mountain context. Enjoy this creative fast motion 2016 holiday video produced by the studioINSITE team.